Interesting article but quite mischievist and misleading. Early in November 2017 ‘your German renewables’ generated at 4% capacity. The only way power was provided was by other surrounding countries and overloading every other energy source. My information is that by 2020 Germany will have spent 1Tr euros on this crazy system and still be producing as much CO2 as 2005. Then there will be more electricity needed as the world goes electrical cars. Blindness to the clean power of Nuclear is destroying our societies. Graeme, official figures show that emissions from the power sector are down by around 15% since 2005; see page 10 in German https://www.umweltbundesamt.de/sites/default/files/medien/1410/publikationen/2017-05-22_climate-change_15-2017_strommix.pdf. 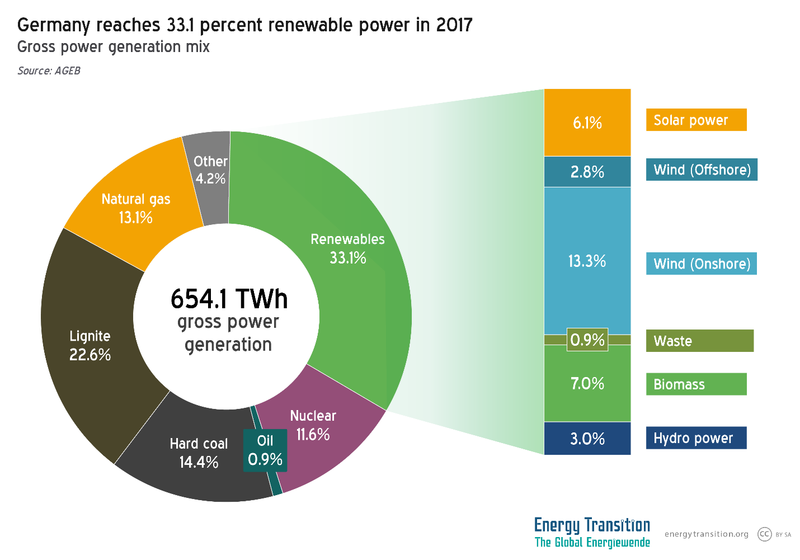 They are also down for all energy as well: https://energytransition.org/2017/10/was-germanys-unrealistic-2020-climate-target-worth-it/. Please source your “1 trillion euros by 2020.” It seems wildly off. the electrification of traffic would need an additional 31 TWh according to the latest publication ( https://www.reuters.com/article/us-germany-power-e-autos/german-power-market-could-cope-with-switch-to-electric-cars-research-idUSKBN1F425I) until 2035. Come with facts, not with blubber. Link to your claims. Actually it was 24TWh from 2016 to 2017 according to the supplied link. Average between 2015 to 2017 was +12,5TWh/a. I think it is realistic to achieve 40% of small cars being replaced by 2035. This would imply roughly 2 to 2,5% addition per year. However, the consumption of such a fleet would rather be somewhere between net 60 to 70TWh, not 30 to 35TWh. This is if you assume a milage of 16.000km/a and roughly 20 to 25kWh/100km net for a 40% electric fleet. In terms of years to install this would be 65/12,5 = roughly 5 years — not one year. AGEB claims that the total gas usage (not only power generation but the gross consumption) increased due to cold weather, heating with gas is popular in Germany. 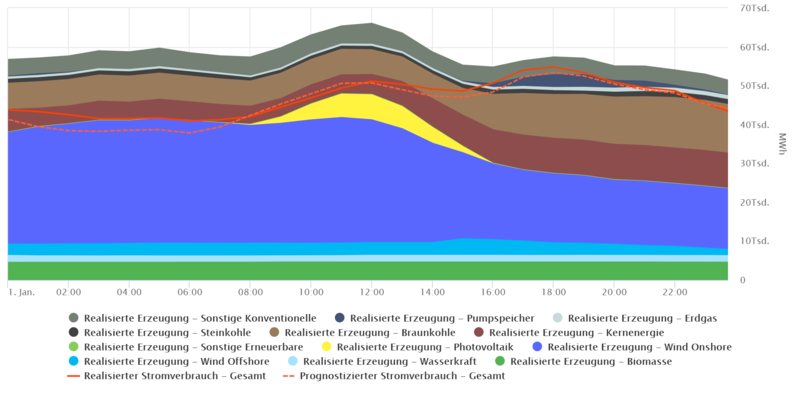 So even if a very bad gas heating efficiency is taken for granted (80%) and a 3.4% of gas power efficiency loss (according to https://energy-charts.de/explanation.htm) there is a big gap of around 20-30% in gross gas usage between Ageb and Fraunhofer (limited to power production). Could it be that AGEB’s report 5/2017 ( https://www.ag-energiebilanzen.de/) is far-off, that Germany reduced the gross energy-consumption in 2017 esp. the CO2 emissions? The difference could be roughly 20-40% of the gross gas TWh claimed by AGEB in their annual report for 2017. Making the year 2017 – if Fraunhofer and Verivox are correct – a year with reduced gross energy consumption and reduced CO2 output provided the other energy sources are covered correctly. The remaining gas would be kept as a national reserve for emergency cases. Hi! I am pleased to read that Germany’s renewable power has doubled the rate which its coal power is being phased out. I hope to see more constructive developments in regards to the future of Energiewende and its policies in the future. The key is getting more EU countries to follow the German and Scandinavian model. I discuss more on Energiewende on my blog. Feel free to check out http://jakeroseliuseuropeanunion.weebly.com for more info! that is over, how will they phase out coal? Yes, now is time for the fairy tale part of the Energiewende to take place… innovation, lol. When the nuclear plants have been closed by 2022, that will mean a lot less “must run” capacity on the grid (You can’t just shut down a nuclear power plant for a few hours or days when there’s low demand, or ramp it down to run at half output or less, like you can with a gas power plant – but that’s exactly the kind of flexibility you need to accommody a high percentage of renewable power on the grid. ), which in turn will put an end to the very low wholesale electricity prices, thus lowering the attractiveness of German electricity for power suppliers in other European countries to a more normal level. This should drive at least a few coal power plants into bancruptcy. 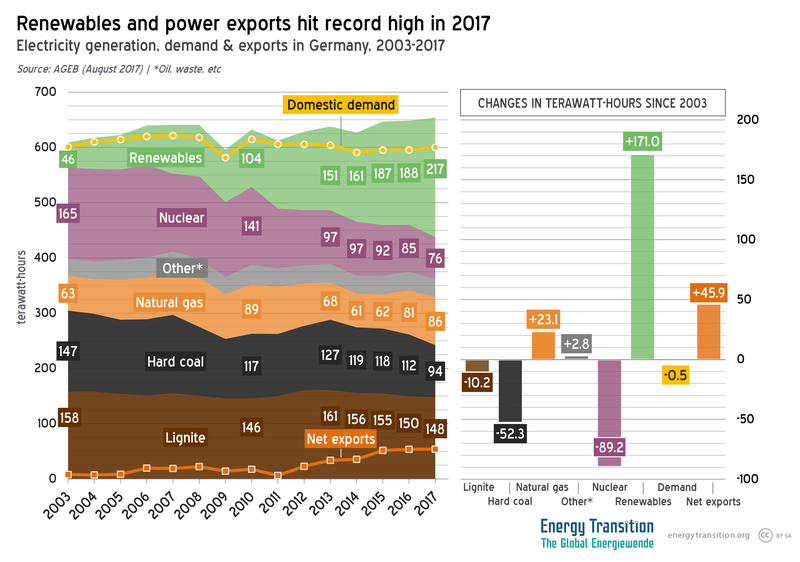 Probably more the ones fueled by imported hard coal (hard coal mining has been in a downward spiral for decades and is due to end in Germany this year, as the subsidies have stopped), though, not the ones burning cheap lignite. Also, there are issues of local grid stability to consider – last time I looked, there were some 40 or so power plants (mostly coal, but some gas too since gas is so expensive) on the list of power plants the owners would like to shut down or mothball because they don’t make (enough of) a profit anymore, but the final decision whether they can be shut down or are still needed to physically stabilize the local grid frequency and such lies with the government. So even if there was some magical way to get rid of the waste (the German nuclear plants have just been stockpiling the waste on site for the last 10 years…) and to be absolutely sure there won’t be any more accidents of a magnitude that makes large areas uninhabitable (or terror attacks that would turn the plant into a “sitting A-bomb”, e.g. by crashing an airplane into the reactor building or spent fuel cooling pool), and even if there wasn’t widespread resistance in the population as old as the industry itself (i.e., since the 1960s/70s), the only way Germany could continue using significant amounts of nuclear power in its electricity mix would be to dangerously increase the existing plants’ running time beyond what they were designed for (which is what the US is currently doing), while building many new nuclear plants – which would take at least a decade and be extremely expensive, as the ridiculously costly power price guaranty needed for the planned new nuclear plant in the UK shows. Which, by the way, is the reason even France plans to reduce the size of their nuclear power plant fleet by a third – they just can’t afford to build enough new plants to replace the old ones. Renewable power plants, even with battery storage (which doesn’t have to be expensive, short-lived lithium batteries – flow batteries with large electrolyte tanks, or low-maintenance physical power storage like frictionless flywheels, pumped hydro or molten salt make much more sense for non-mobile applications like grid stabilization, peak shaving, or storing power just a few hours to shift it from the noon solar peak to evening demand), is considerably cheaper already than building new nuclear plants, and will be much cheaper by the time the nuclear plants would be finished and go online. Clearly you don’t care for facts. Even laymen know that nuclear reactors don’t turn into atom bombs. The sophistication of such a terrorist attack (your airplane doesn’t work) would be fitting of a heist movie and it’d be far easier for this terrorist group to simply make their own bomb than trying to build one on the spot after infiltrating a plant. I sincerely hope I this was a joke I didn’t get and not intentional deception. The relevant harmful aspects of uranium mining is accidentally disturbing ground water or danger to miners (plenty of bad stuff there). The shipping and containment of unspent fuel is not an aspect to consider particularly relevant on the emissions front. If we’re to look to current technology and practice solar is not friendly in the materials aspect. Their operational emissions are zero but the manufacture and disposal practice isn’t particularly strong. They do need replacing, it’s worth remembering. I don’t find either to be a particularly big problem though as it’s solvable and the overall benefit in replacing any of the fossil sources is huge. 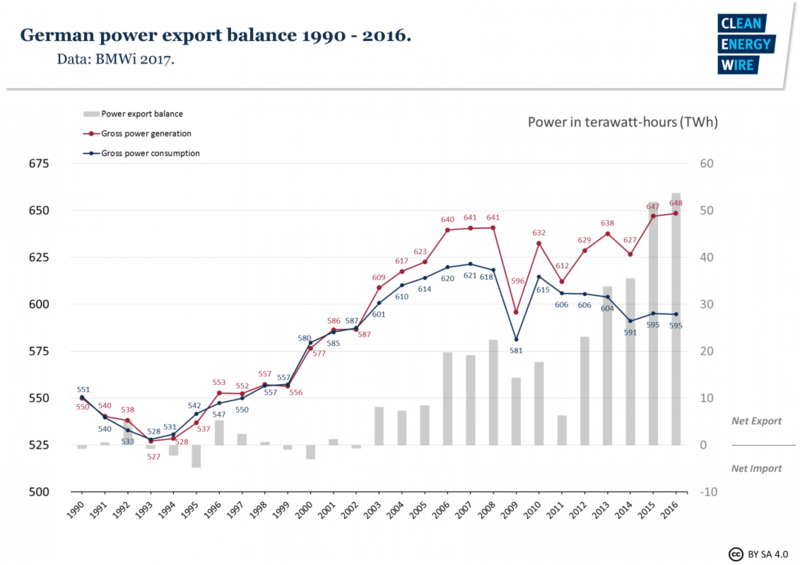 On the whole I’m happy to see Germany moving to more renewable energy sources but the recent (2010+) imports are concerning. The drop in fossil fuel sourced energy has been very steady since options were a realistic thing. But now with the nuclear dropping out you’ve moved to fossil fuel imports which is trivial to see in the % of energy that’s provided fossil fuel. At least you didn’t grow that much on that front. It’s something this article doesn’t feature aside from the mention of the difficulties with 100% renewable. Personally I find most articles focus too much on renewable instead of carbon-free. I think you raise a good point here we need more effective carbon pricing, the current levels are very low with quite a few articles putting this closer to 200usd per tonne. This is about the same as the combined taxes paid on road fuels in Europe. This is a politically difficult subject however one approach might be to start by explaining to the general public that in many cases fossil fuels are damaging our health and wealth. The next step would be to issue free carbon credits based on average eu level per capita upto current level within that eu nation. Ie if the nation is already below the eu average then no more credits would be available. This would apply pressure to the most polluting nations and boost carbon price. Next step would be to reduce the credits to the global average. To ensure that this was not just exported (there is a case to say the EU28 has just shifted production and boosted consumption https://www.carbonbrief.org/mapped-worlds-largest-co2-importers-exporters) a carbon system for imported goods should be introduced outside the single market. Other environmental taxes and charges should also aim to assist the poorest with an allocation of the funds raised to reducing there carbon footprint. Ie investment in public transport infrastructure, housing etc. The article points out that there is natural variation across Europe due to weather pattens as well as future increased requirements for electricity for transport. As has been pointed out there is a need for increasing the despatchable power. Pumped hydro investment is likely to be the best technology in many places as it is a well proven technology with a long service life (75-125 years for the basic infrastructure, although some updates to turbines and electrical systems would be required every 25-35 years). In the future end of life transport batteries could so be repurposed for this application. (Current home batterystireage doesn’t become financially viable until prices hit approx €0.30 per kWh) Improving interconnection is also key, as in many countries off peak baseload is approximately 50 percent of peak load then interconnection for 50 percent of local requirements would help smooth market prices as well as move power across Europe. – promote investment in converting the newest traditional generators coal powered generation plants to combined cycle gas turbines (as much of the infrastructure is similar), ideally with district heating as this will help match peak winter loads in Northern Europe and displace electrical heating requirement in current fossil fuelled heating markets. ii) existing or develop new inter connector capability. In both cases approximately 25-40 percent of renewable name plate capacity should be provided, potentially this could be on a mix ie cap and floor for each (interconnector and storeage). 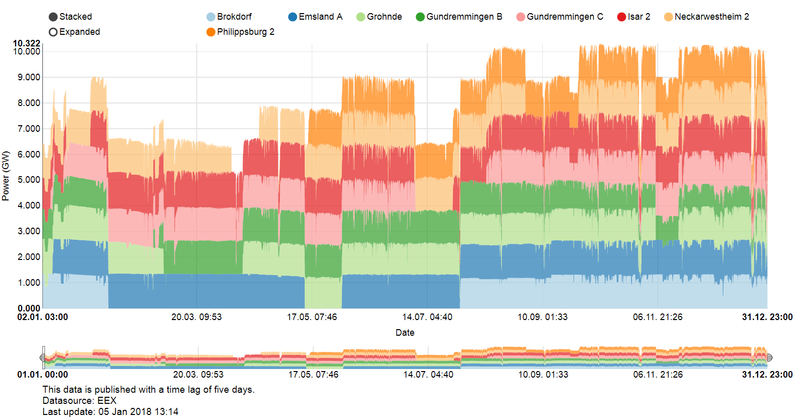 Nah, $580 billion is too much to have paid for such a tiny fraction of the German grid. At say $5 billion per GW for overnight nuclear assembly line built in a big government push, Germany could instead have 115 GW of nuclear power putting out 1016 TWh per year. Germany could be off all coal, gas, and even oil at that price! But what have they got instead? Wind and solar toys that rely on neighbouring countries to ‘firm’ them when they’ve gone on strike! Forbes is breaking this story.